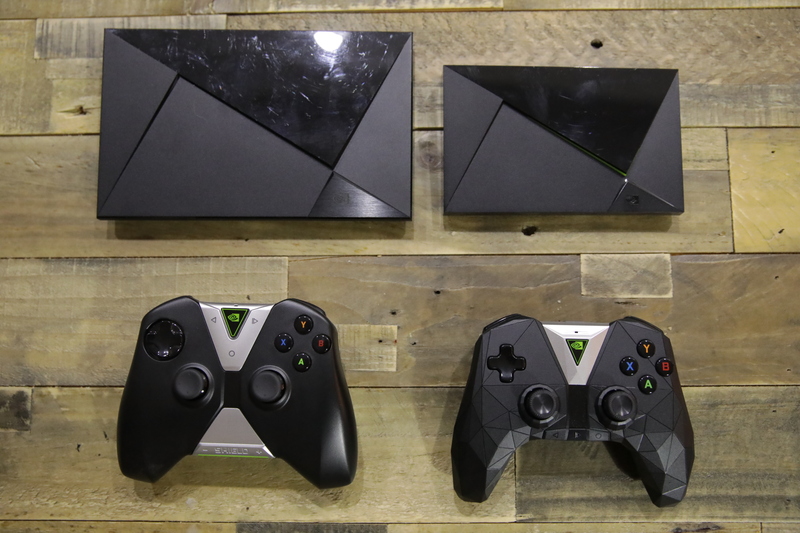 Nvidia’s Shield line of devices is now more than six years old, and the latest member of the family is the new Shield TV, an update of Nvidia’s first set-top streaming box from 2015. The 2017 version slims down the console to a remarkably portable rectangle, adds a redesigned controller with a built-in ambient microphone, and includes a more traditional wand-like remote in the box. The $199 device (or $299 for a larger version with a built-in 500GB hard drive) has big ambitions: Nvidia wants Shield TV to be not only the only streaming TV box you need, but also a gaming console, a smart home device and a personal digital assistant all in one. Yet it’s also virtually unchanged in terms of internal hardware from what Nvidia first released in 2015. Software makes it feel like a completely new device, however – and that’s going to benefit both existing users and those new to the Shield platform. 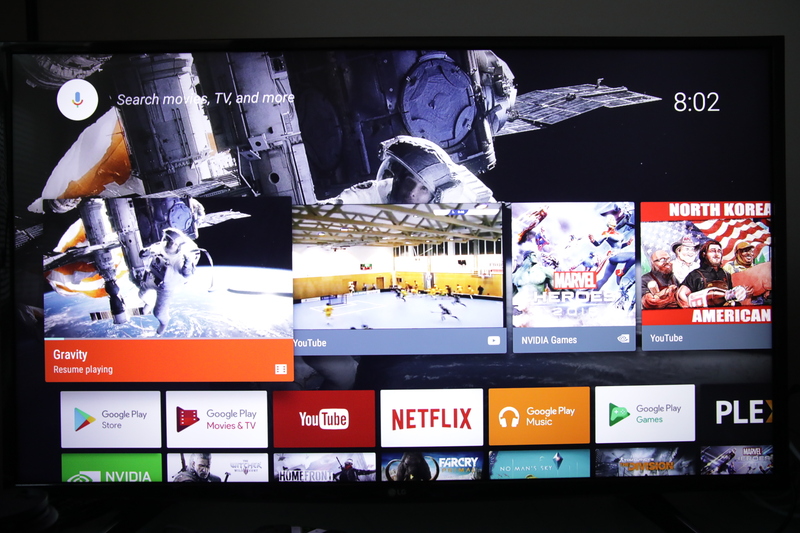 Under the hood powering Shield’s operating system is Android TV, in perhaps its most successful iteration. 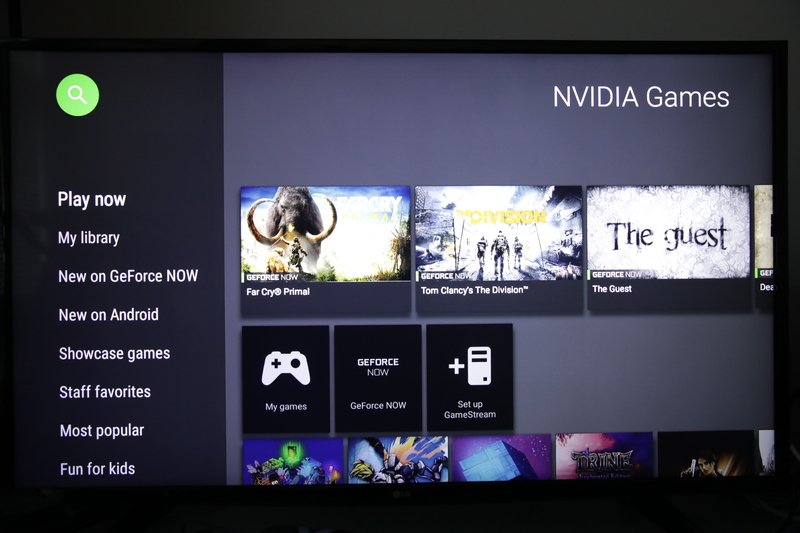 The new Shield brings an Android TV 5.0 upgrade, along with Android 7.0 Nougat, which Nvidia has used to improve its own custom navigation interface. There’s a much less confusing games section that groups all content under one broad “Games” category, for instance, which replaces the Shield Hub app. More generally enjoyable additions with this software update include the ability to adopt external storage as native, which means you can plug in external flash drives via the two USB ports on the back and have those act as fully accessible storage space for games and media. This means buying the entry-level $199 model makes a lot more sense; if you ever find you need more space, it’s a fairly easy and inexpensive upgrade to pick up a high-capacity 128GB flash drive, like the one included in the review kit sent by Nvidia for testing. That’s a big advantage over other streaming devices like Apple TV, too, which have hard limits on internal storage capacity. Other improvements with the software update include a built-in Amazon Video app which allows you to stream content, and access Prime Video if you’re a member. This also provides access to 4K HDR Prime video content, which is a significant upgrade for those who have the requisite TV or display hardware. Android TV still also offers a wealth of media apps from the Play Store, meaning you’ll likely be able to find what you’re looking for in a streaming service provider. If you haven’t looked at Android TV since its launch, there’s a lot on offer now, and cord cutters are unlikely to feel a content pinch. Voice control and cross-service search means you can press the mic button on your controller and use voice queries to find content across Google Play Movies, Hulu, YouTube, Plex and more, you can search once and find anywhere – even in your existing media library via Plex, which is again not something you’ll find with Apple TV. 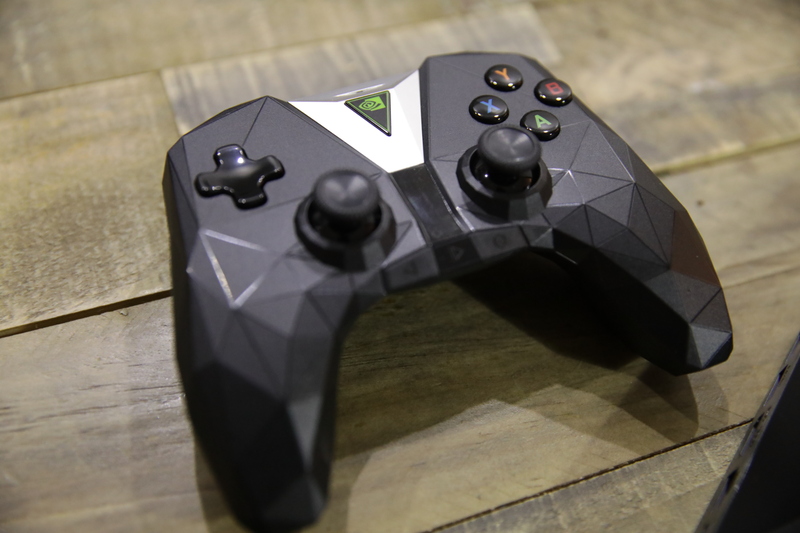 On the new Nvidia Shield, the company has changed the way it serves up games with an eye to creating a device that’s truly capable of replacing your home consoles and gaming PCs. It does this with changes and improvements to both GameStream the service Nvidia offers to stream games locally from your Nvidia-powered gaming PCs, and GeForce Now, the $7.99 per month subscription game streaming service that runs titles on Nvidia’s own servers but lets you play them as if they were being run locally. The updates to GameStream mean you can now stream at up to 4K HDR resolution, providing the game supports both, and you’ll also get haptic feedback to the new controller from the game. It is indeed a much-improved experience, and one that basically means your gaming PC can follow you around the house wherever you happen to have a display and the desire to play. GeForce Now’s upgrades, however, are the really big deal here. The new backed means that games are running on servers with Pascal-powered graphics output, with either GTX 1070 or 1080 GPU power behind them. The quality is amazing, and combined with a 4K display, will beat just about anything you can get from your home console, as I verified playing titles like The Witcher 3 and Homefront, as well as The Division and Far Cry Primal, titles now available through Nvidia’s new day-and-date release partnership with Ubisoft to put all their games on GeForce Now. I tested GeForce Now in a variety of conditions, using both wired and wireless connections. A wired Ethernet connection direct to my home modem worked best, with a connection that effectively gets about 6 Mbps consistently at max speeds. Using this set up, I could not tell that I was playing the game remotely. With a wireless connection, there were some tiny hiccups, but the experience was still very playable, and graphics still exceeded what I can get out of PS4 and Xbox One locally. Brand new games still cost a lot (what you’d expect to pay for new releases), on top of the GeForce Now subscription, but the subscription comes with a decent back catalog included, and you don’t need to buy or maintain expensive PC equipment. It’s probably the defining factor of why you’d want a Shield instead of anything else right now, and it’s a powerful motivator for anyone interested in gaming – and even some who aren’t. My dad, who hasn’t played a video game since Super Mario Bros. 3 on original Nintendo, got caught up in Far Cry Primal and now is considering a shield for his next streaming device. 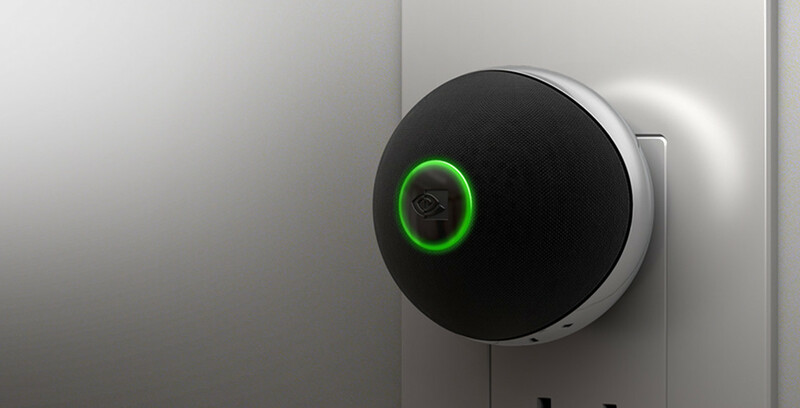 A lot of what the Shield brings to the table is still in hibernation – Nvidia has teamed up with both Google Assistant and SmartThings to turn the console into a full-fledged Amazon Echo competitor. The SmartThings integration will let users turn it into a smart home control hub for an additional $25 when it arrives, providing control over connected lights, appliances and more. The Assistant integration, also coming later on, will enable the ambient microphone in the Shield controller and let you use “Ok Google” commands to control smart home, check weather and more. Nvidia’s also bringing something called the Nvidia Spot to market later on, which are plug-in microphones you can spread across your house to issue voice commands to your Shield and Assistant from wherever you happen to be. These connect over Wi-Fi and will retail for around $50 apiece. The fact that these features aren’t yet available is a bit of a problem, but not as much as you might think. Nvidia’s pricing for the Shield is the same as it has been, starting at $199, and there are other improvements beyond the availability of Assistant. These latent feature promises just mean that the Shield’s value proposition will only increase over time. Think about it this way: it’s like buying an Apple TV now, and getting a Google Home pushed to your device later as a free over-the-air software update. The other big reason to pick up a Shield over other streamers is its extensive 4K and HDR support. I actually picked up an LG 4K HDR LED television in part because I wanted to see what the Shield was truly capable of, in fact. The results were indeed impressive, and made one thing very clear: If you’re looking for 4K HDR content, this is the best streaming device you can get. It includes Amazon Video 4K HDR streaming, including Prime shows like The Grand Tour, out of the box. Even Amazon’s own Fire TV devices don’t offer HDR from Amazon Prime. It also has 4K HDR for Netflix, 4K YouTube and 4K for Google Play Movies. 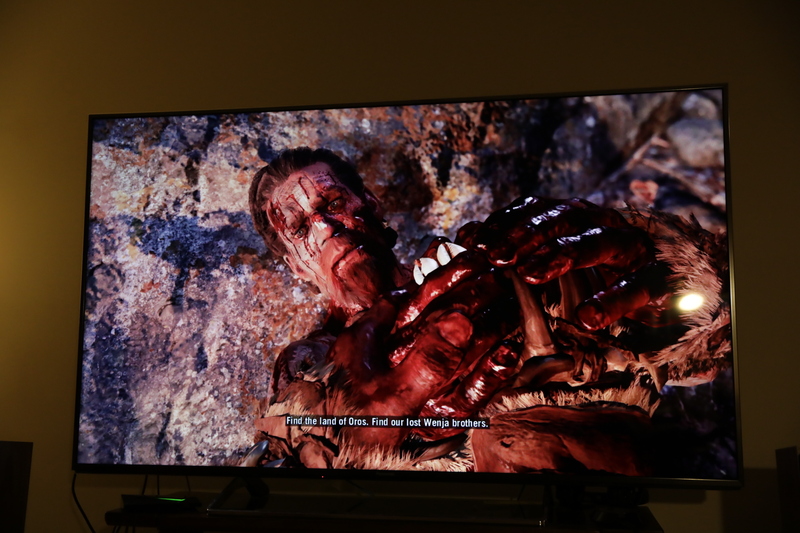 Games streamed from your local PCs can access 4K resolution, too. Basically if 4K HDR is a priority, this is the way to go. Nvidia takes graphics to heart, and it shows on the new Shield. Maybe the most impressive thing about the new Shield is that you don’t actually have to buy one to experience the new features; all of the software updates described above, including 4K HDR and streaming improvements, are available to existing Shield TV device owners via a software update just pushed out on Monday. If you pick up one of the new, redesigned Shield controllers for $59.99, which will be used for the ambient Google Assistant features later on, you’ve got the new console (minus the slim new design). Nvidia says it left the Tegra X1 processor and other internal components the same because it was already 3x more powerful than the competition in areas where it counts, and the price maintenance means new Shield buyers are basically getting everything they would’ve gotten before, plus the Shield Remote in the box. If you’re looking for a device that can replace as many of your home theater components as possible, the Shield TV is it. Support for live TV via USB tuners with the new Live Channels app means if you have an antenna, it’s also everything you need for getting and navigating traditional over-the-air TV, too. Some companies try to be everything and end up compromising all experiences, but Nvidia’s Shield TV is a true all-in-one that suits the needs of most people.